Pause for a moment today, March 7, to think of Jean-Dominique Bauby. On this day in 1997 he had his book Le Scaphandre et le Papillon (The Diving-Bell and the Butterfly) published. Two days later, at the age of 44, he died. Thanks to the film his story is well-known. The former editor of the French Elle magazine, he suffered a massive stroke at the height of his career and recovered only enough to move his left eyelid. He retained complete cognizance of the world around him but suffered what is called Locked-In Syndrome. Eventually he and his therapists developed a system of communication whereby, while stepping through the alphabet, he would blink on arrival at the letter of the word he wanted to spell. Then on to the next letter, and then the next word, and so on. By such painstaking perseverance a book was written — and a beautiful, affecting book it is. You should read it. The next time I feel a whine coming on about how difficult writing can be, I’m going to think of Jean-Dominique, feel truly humbled and thank my lucky stars. Then get back to the keyboard. Bravo to Canadian writer Jonathan Garfinkel for giving us Ambivalence – Crossing the Israel/Palestine Divide, which is an account of his travels in the Mideast in search of Capital T Truth. Like most books of this type, it recounts much more than just the physical journey — Garfinkel traverses memory, politics and culture, traveling miles from his Zionist-Canadian roots. This is a brave effort; one wonders what sort of personal fallout the book is going to create for Garfinkel. Needless to say it’s not going to make it as a ‘Heather’s Pick’ at Chapters-Indigo, and there will be some on the pro-Palestinian side who will criticize him for moving only to a state of ambivalence on the issue — not outrage. But one shouldn’t underestimate the scope and meaning of such a shift in perspective. The ideologies and prejudices that get hardwired into us as children are often those to which we cling most tenaciously. We don’t get to choose the time, place or culture into which we’re born, nor do we get much say in our earliest encounters with some of the most influential people in our lives. These include teachers. Garfinkel borrows from a fiction writer’s toolkit in creating a composite character of just such a dominating and influential personality — Mrs. Blintzkrieg. She haunts and taunts his thinking long after he leaves the grade school Zionist classroom she ruled. She is an effective device, the physical manifestation of childhood indoctrination who pops in and out of the story to express her disappointment in her former student. The old tapes keep playing, but Garfinkel continues to seek understanding while confronting the realities of the Israeli Occupation. Although Garfinkel has a couple of volumes of poetry to his credit, any traces of stylistic gloss are overshadowed by the weight of the subject matter. Discussions of the Occupation vary only in the different layers of tragedy and suffering they reveal. As Remembrance Day approaches what better way to begin than with Winston Churchill: robust; magisterial; every sentence a torchlit procession. On May 10, 1940, the King asked him to form the government; here’s what he wrote about it at the close of his first volume on the Second World War, The Gathering Storm. One sentence, traveling the full distance of the war. It’s surprising how conditioned we’ve become to short sentences. One of the first edicts I encountered (and chafed at) as a young reporter was, “No ledes longer than 25 words.” And the web, invariably, is serving to further abbreviate (constrict?) the written expression of thought. For the record, the Churchill sentence quoted above is 74 words. A comma-phobe he was not. And Churchill may be a rank amateur at the long sentence compared to Canadian writer Rudy Wiebe, but I digress. Granted, the long sentence in lesser hands can convolute (Quick! Someone tell me that isn’t a verb!) into tangles of meaning, but then clarity in writing is clarity in thinking. During these last crowded days of the political crisis, my pulse had not quickened at any moment. I took it all as it came. But I cannot conceal from the reader of this truthful account that as I went to bed at about 3 a.m., I was conscious of a profound sense of relief. At last I had the authority to give directions over the whole scene. I felt as if I were walking with Destiny, and that all my past life had been but a preparation for this hour and for this trial. Eleven years in the political wilderness had freed me from ordinary party antagonisms. My warnings over the last six years had been so numerous, so detailed, and were now so terribly vindicated, that no one could gainsay me. I could not be reproached either for making the war or for want of preparation for it. I thought I knew a good deal about it all, and I was sure I should not fail. Therefore, although impatient for the morning, I slept soundly and had no need for cheering dreams. Facts are better than dreams. Wow. You’re free to think Churchill is just portentous bombast, but I love it. And fess up: when’s the last time you used ‘gainsay’ in a sentence? Granted, try speaking that way among your friends (if you can!) and you’ll be efficiently ostracized. Alas, they don’t make world leaders like they used to. It makes you wonder what we might expect in the memoirs of someone else who has made an extraordinary contribution to the public discourse. 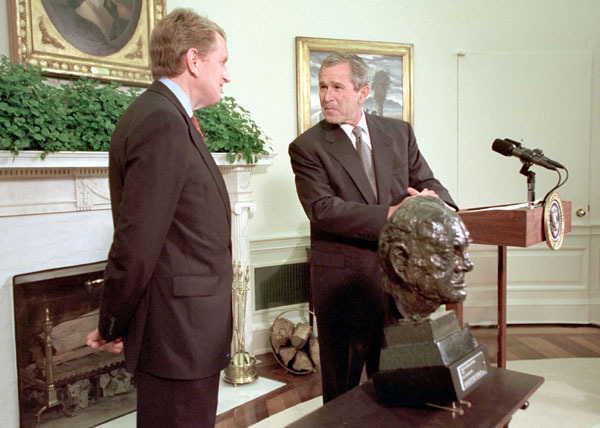 Yes, that’s a bust of Churchill. And if you ask me, he looks a little pissed to be in the same room with George Bush.